We’ve been interested in Ketofol for many years in Virchester. We were early adopters as the pathopharmacological argument makes sense for patients requiring sedation for short painful procedures in the ED. A mixture of Propofol and Ketamine should address the 4 requirements of procedural sedation in the ED, analgesia, sedation, amnesia and (to some extent) anxiolysis. You can read more about the Virchester approach to sedation here. 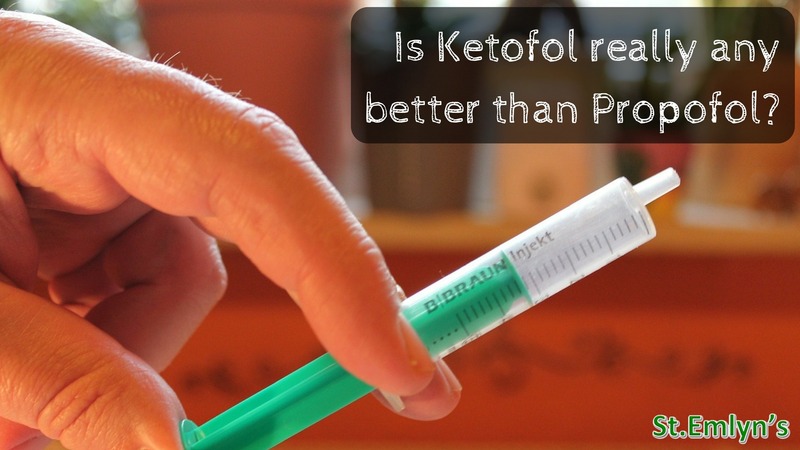 Back in March this year, Janos Baombe reviewed a meta-analysis of 18 RCTs comparing Ketofol with Propofol and although we had some concerns regarding the papers included in that study there was little convincing evidence that either was better. In clinical practice I still hear quite vociferous arguments in favour of both strategies. Personally I’ve not found the current evidence definitive and am happy to use either. I usually use Propofol in a population of patients who have also received opiates (usually morphine or fentanyl) prior to the procedure as I think it’s good practice to control pain before trying to sedate the patient. Occasionally I will use Ketofol in patient in whom we have struggled to analgese well with opiates, though arguably I could just use a sub dissociative ketamine separately. Despite the hype from some quarters I’m not that convinced that Ketofol is that much better than a balanced approach to sedation. I will admit to being a bit of a fan in the early days, but following the Andolfatto trial I lost my enthusiasm. So, it’s always great to get new evidence and we have a new RCT to look at, the POKER trial. The abstract is below, but as we always say, please go and read the full paper yourself. This paper is from Australia and is published in the Annals of Emergency Medicine. This is a randomised controlled study using a system of block randomisation. This is the appropriate design for a trial of a therapeutic agent. There is no placebo here as it is comparing two treatments against each other. The drugs when made up look similar and so the operators should be blinded to what has been given. However, ketamine has effects that may reveal themselves to the observers. Nystagmus, mouth movements and posturing are more common with ketamine and it is thus possible that those using the drugs may have been able to identify which drug was being used. We use sedation for a wide variety of patients and so it’s important that randomisation hopefully leads to a balance of conditions and indications in both groups. This does appear to be the case in table 1 where the two groups look similar. Previous studies have been criticised for not reflecting real world practice, patients may have been denied other analgesics, or required wash out periods for opiates and that really does not reflect my practice. We give sedation to patients at the point when they require it, and when it is safe to do so. Artificial restrictions don’t really make sense to me and so I was glad to see that this study takes a more pragmatic approach. Patients (adults) were recruited at the point when they needed sedation and previous therapies were noted, but not used as a restriction. In other words this group of patients in Australian EDs probably reflects a similar cohort to mine in Virchester. Sedation was standardised on the basis of volumes. The Ketofol and Propofol look similar and so patients received sedation based on mls/Kg given over set time periods. If they needed more than 20mls (unusual but by no means rare in Virchester) they got Propofol alone. The principle outcomes were around complications of sedation, namely apnoea, hypoxia, hypoventilation, layngospasm or aspiration. They also looked at patient satisfaction and cardiovascular effects. This is interesting to see a trial based around complications rather than patient experience as a prime outcome but it makes sense as one of the main reasons to advocate Ketofol has been the assumed improved safety profile. The study is the largest of its type (573 patients) and was based around a sample size calculation that sought a difference of 10% (20-10%). That’s a huge difference, and although it was based on previous studies it’s a much higher incidence of complications than we see here. What are the principle findings? In terms of the respiratory and cardiovascular complications there was no statistically significant difference – 9% for propofol vs 7% for ketofol. A much lower incidence than they expected from the sample size calculation and just a 2% absolute risk reduction which is of questionable clinical difference in any case. Other outcomes were also broadly similar with some minor differences in speed to recovery. Patient satisfaction was not significantly different either. There was a slightly increased incidence of delerium in the Ketofol group (but small numbers) and interestingly patients in the Propofol group also suffered delerium (2% vs 5%). For fans of Ketofol it really does appear that there is increasingly little evidence of a demonstrable difference in its safety or effectiveness. Here in Virchester we still cannot firmly recommend either therapy. They both seem to work, the safety profiles are very similar and patients are fine with either. Ketamine is a controlled drug in the UK and so getting it out of cupboards with double signatures and the required red tape is a hassle that’s only really justified if there is a good reason to do so. The bottom line for me is that in the absence of a difference in this trial or in past meta-analyses I will probably carry on following the principles of good sedation. I will generally use Propofol, but perhaps still use Ketofol if I feel that I’ve not quite got on top of the analgesia with opiates. The POKER Trial: Go All in on Ketofol? Excellent review from Salim. Am J Emerg Med. 2016 Mar;34(3):558-69. doi: 10.1016/j.ajem.2015.12.074. Epub 2015 Dec 29. Ketamine-propofol combination (ketofol) vs propofol for procedural sedation and analgesia: systematic review and meta-analysis. Jalili M1, Bahreini M1, Doosti-Irani A2, Masoomi R3, Arbab M1, Mirfazaelian H4. Acad Emerg Med. 2015 Sep;22(9):1003-13. doi: 10.1111/acem.12737. Epub 2015 Aug 20. Ketamine-Propofol Versus Propofol Alone for Procedural Sedation in the Emergency Department: A Systematic Review and Meta-analysis. Yan JW1,2, McLeod SL1,2, Iansavitchene A2. SGEM#114: Ketofol – Does It Take Two to Make a Procedure Go Right? Next: Next post: A new view on life. Augmenting Reality at St.Emlyn’s. It’s interesting that we don’t use conscious sedation regimes called fentanofol or fentazolam but when we employ ketamine as an agent we use fixed proportions. Balanced sedation or balanced doses? This is the answer to a question I’ve never asked (and I use ketofol frequently). But I only use it in specific populations not a general population and I think most of my colleagues are the same. The elderly, those with dodgy airways, the hypotensive to name a few will get this combo. How about a study in these (high risk?) populations? I think that would inform our decision making more than just a general population. I think we are stilling missing the point of ketamine / propofol sedation. Two different drugs, with different pharmokinetics and pharmacodynamics; with mixing to create ‘ketofol’ we blunt the effectiveness of each. Doesn’t it make more sense to keep the drugs separate and to dose each one according to the desired effect. Brief procedure – more propofol. More analgesia required – more ketamine. Not more of a both in a set ratio. This results in even less adverse cardiorespiratory events, whilst maintaining high patient satisfaction. I think that’s what we do – have you seen our post on balanced sedation?